When I moved to the Appalachians a couple of years ago, my workshop went from a climate controlled room inside the house to an uninsulated, drafty shed. 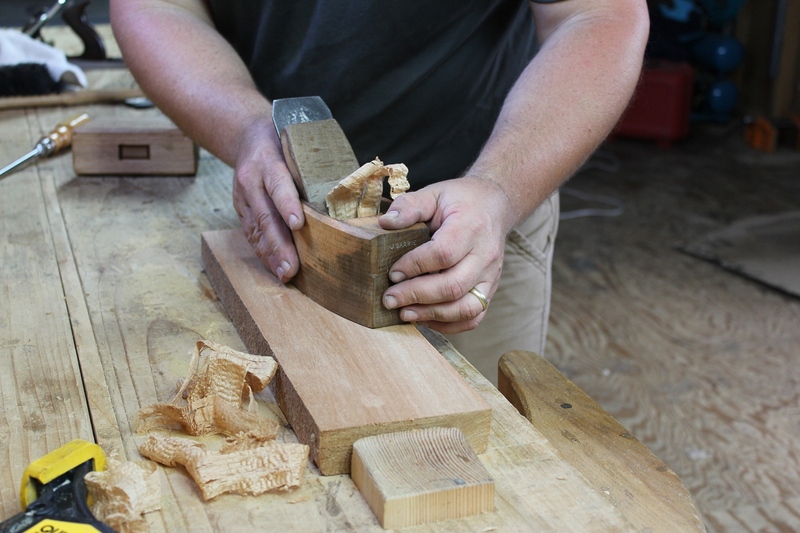 Because of the constant moisture changes in the outdoor environment of my new shop, I found that my wooden hand planes tended to go out of tune more often than I was used to, and more often than I wanted to deal with. As a result, I sold a lot of my wooden planes and went back to primarily using metal planes. However, I have a hard time staying away from wooden planes. I really like using them when I can. 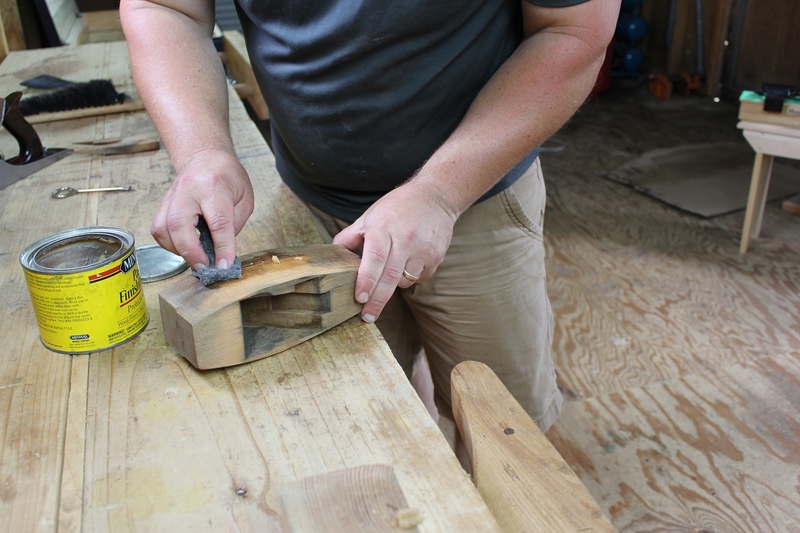 I also occasionally do period woodworking demonstrations where wooden planes are necessary. So I decided to add a few basic wooden planes back to my kit. I had intended to make a new coffin smoother, however, the beech that I had did not dry well and had a lot of internal checks, relegating it to the fire pit. So instead, I purchased an old double iron coffin smoother. Of course, none of these old wooden hand planes ever arrives in usable condition, so I had a bit of work to do in order to put it back into service. 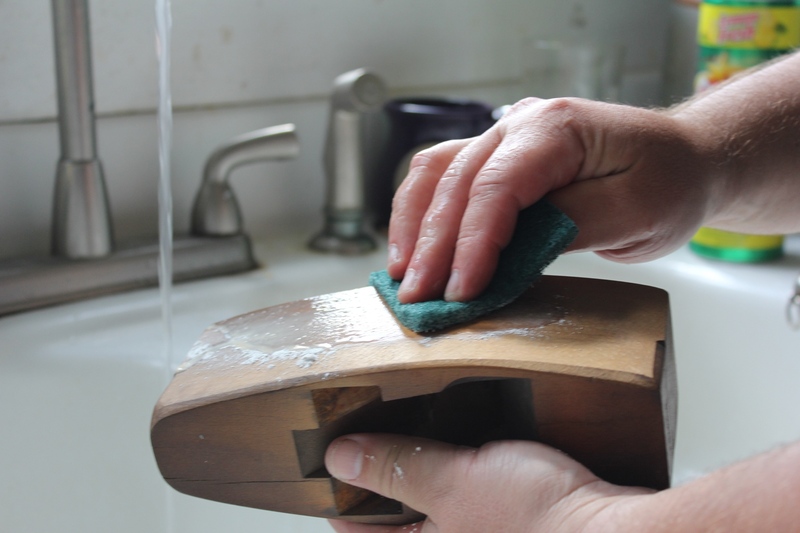 Wooden planes can simply be cleaned with whatever soap or detergent you have around the house. The first thing I do with an new-to-me wooden plane is clean it, if necessary. If the plane is clean, you can skip this step. However, this one was quite grungy when I received it. Cleaning wooden planes is not a complicated affair. Just about any household soap or detergent will work. One of my favorites is liquid automatic dishwasher detergent. It cuts through the grime and restores the luster of the wood quite nicely. However, we don’t have an automatic dishwasher, so I just used regular old cleanser and a green Scotchbrite pad to scrub the grime from the surfaces. Once clean, I rinsed the plane with warm water to get the residual cleaner off and put it aside to dry. The chipbreaker is soft enough that it is easily worked with a file. While the body and wedge of the plane were drying, I worked on the iron and chipbreaker. Both were quite rusty, so I had put them in for a soak in Evaporust the night before. After removing them from the Evaporust, I took them to the wire wheel on my bench grinder to clean them up. Once cleaned, the bevel of the iron was reground and the iron was honed. The chipbreaker was then lapped on a file to mate it well to the iron, and the front edge of the chipbreaker was also lightly filed to remove minor pitting right at the edge that could catch shavings and cause a clog. The sole of a wooden plane is easy to flatten with another plane. When the body of the plane was dry, I flattened the sole by planing it with another plane set for an extremely fine cut. I’m not trying to remove a lot of material here. Doing so will only serve to open up the mouth even more. Instead, I’m just trying to shave off the high spots and bring everything to flat again. I checked with a straightedge both along and across the sole to make sure everything was nice and true. 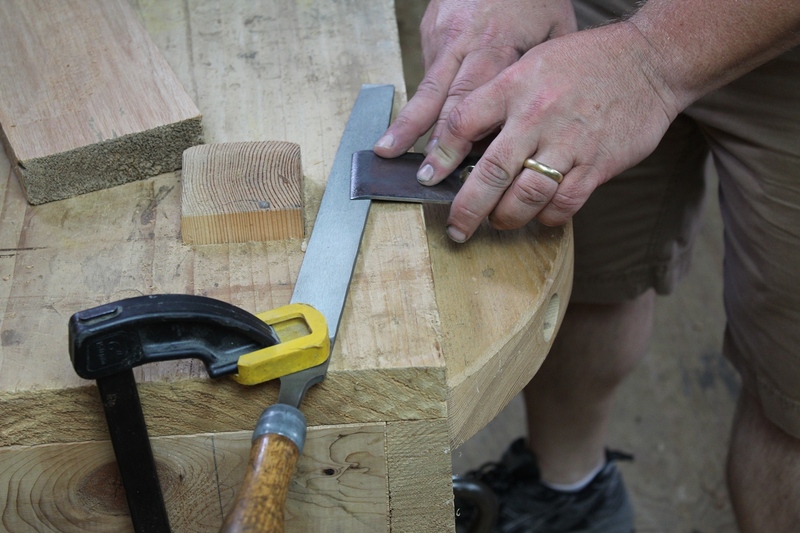 If you aren’t comfortable using a plane for this step, you can lap the sole on a flat piece of glass or a granite surface plate. Don’t use anything coarser than 220 grit paper for lapping a wooden plane though. Anything coarser than 220 grit will remove material too quickly. It’s better to go slow and check your progress every few strokes. The best finish for an old wooden plane is wax. With the sole trued, I added a bit of protection to the plane in the form of paste wax. I used to use linseed oil, but over time, and with use, linseed oil tends to turn the body of the plane black. 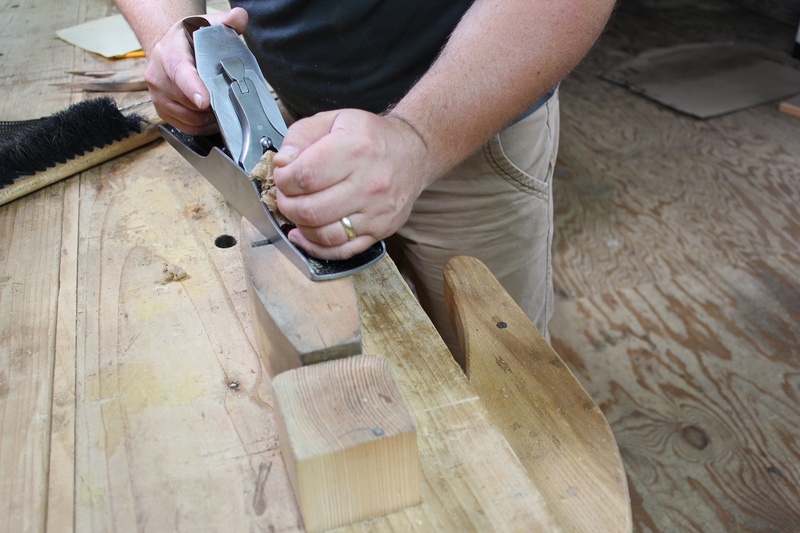 So I no longer use linseed oil and instead just apply a good, heavy coat of wax, making sure not to get wax on the bed of the plane, the inside of the wedge mortise, the back of the wedge, or on the wedge fingers themselves. The wax was allowed to dry for about 15-20 minutes, and then the plane and wedge were buffed with a couple of rags cut from an old flannel bed sheet. The plane works, but just OK. There are still some improvements that can be made. Once the wax was buffed off and the blade reassembled, I set the iron and wedge and tested the plane out. After flattening the face of this board with my metal jack plane, I tried out the “new” coffin smoother. It works, but just OK. I think there are still a few improvements that can be made. Posted in Hand Planes, Tools and tagged coffin smoother. I was wondering whether it would make sense to boil wooden planes in brine. This is standard procedure in Finland for wooden mugs (kuksa) and many people think it is to dry them out faster. My take is that the goal is to impregnate the wood with salt. Because salt is hygroscopic it potentially buffers the moisture content in the wood, preventing cracks and possibly warps (preventing cracks in wooden mugs in clearly a good idea). We are doing some tests with friends — not related to mugs or planes — but I was wondering whether it would be a helpful practice for wooden planes too. That’s a good question. I’m not familiar with the practice, and I’ve never tried anything like it myself. My main concern would residual salt left in the plane body causing the blade to rust. Kuksas don’t typically have to worry about prolonged contact with metal. In a plane, however, the iron is always in contact with the plane body. So I’d imagine it would rust fairly quickly. Moving to metal planes! Wow. I never thought I would want to use them until I tried them. I think I read some where that people would soak wooden planes in linseed oil. I would rather do that then boil it. I have a few planes that take a lot of blows to adjust the iron. Maybe wax the wedge? Plane it a bit? Well, moving back to metal planes. I used them for many years before starting to get into wooden planes. Some people soak wooden plane bodies in linseed oil. I don’t bother. Wax works good. If the iron is hard to adjust, it’s likely that the iron is too tight, not the wedge, unless you are just fixing the wedge too tightly. You shouldn’t need to beat on the wedge to secure things. Just a couple of taps should do it. If you’re not over tightening the wedge, then your plane body likely shrunk around the iron. You may need to grind the sides of the iron down slightly.